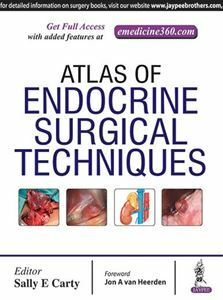 The Atlas of Endocrine Surgical Techniques is a lushly Illustrated Surgical Atlas, that captures the entire field of Endocrine Surgery in 29 chapters. Written by Expert Faculty members from leading US, European, and Asian medical schools. The work is organized into Four Sections devoted to Thyroid Surgery, Parathyroid Surgery, Adrenal Surgery, and Surgery for Pancreatic and Carcinoid Tumors. Specific techniques are covered for endoscopic resection of all four major types of endocrine tumors. Novel topics include surgeon-performed ultrasound for Thyroid Nodules, Robotic Thyroidectomy, Molecular Testing of Thyroid Nodules, Reoperative Parathyroid Surgery, Parathyroid Autotransplantation and Cryopreservation, Adrenal Metastasectomy, Resection of Small Intestinal Neuroendocrine Tumors, and Hepatic Metastasectomy for Neuroendocrine Tumors. Many chapters include videos that demonstrate surgical techniques and expertise. A wealth of anatomic illustrations along with abundant intraoperative photographs and imaging studies. Chapters 1, 4, 12, 16, 18 and 20 contain video(s).